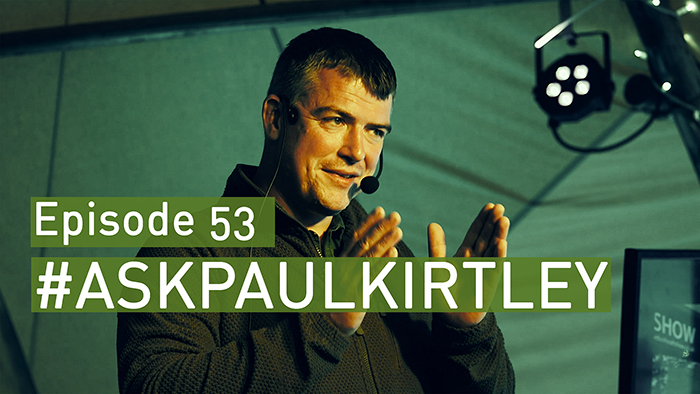 This episode of #AskPaulKirtley was recorded in front of a live audience at the 2017 Bushcraft Show in Derbyshire, U.K. There was a wide range of questions from the audience, none of which were known to me before the session. It was fun to do and we got through a lot in the hour I had. I really appreciate everyone who attended this session to show their support, ask questions, and listen to the answers. The recording is available as the usual video and audio podcasts, all of which can be played or accessed below. Hi Paul. Just finished a couple of months of listening to all your APK podcasts with No. 53, and just wanted to simply say a heartfelt thank you. It’s been a great learning experience, and a great way of using my daily commute time to refresh and learn new things. Really enjoyed the latest live version and am looking forward to learning more in a few weeks time on a Frontier course. Cheers. Neil. I’ve just watched your video of episode 53 and as usual enjoyed the question and answer session, I must confess I do not watch nor read your blogs very often but when ever I do, I very much enjoy listening to your lectures(hope you don’t mind me calling it that) this particular session reminded me of my youth,when you spoke about yours, and how you became involved with Bushcraft its a whole life time of living experiences that culminates to where we are. I find you very genuinely informative with out being patronising , keep up the good work . It was good to see you and your team at the show. Thank you for the thorough answer to my puri tab question, I had not thought of rose-hips. I do have a couple of filters, one that lives on the end of my water bladder. The issue I have with them is that they only filter onto 0.2 microns. A single virus range in size from 0.005 to 0.3 micro and although a small chances of a single virus causing a problem there is a chance. Normally I boil my water as that is the definitive solution after cause filtration. If I am moving over long distances chemicals become the quick solution. I really enjoyed listening to your presentation on Bushcraft 2017 show! You made us out here feel almost like we were actually in the audience. Excellent! There’s something to be said for a live show with an interactive audience! Well that’s it… I’ve watched every #AskPaulKirtley video and listened to every podcast, some more than once. I have no idea what I’m going to do whilst waiting for the next installment (another podcast would be epic!). Perhaps work on my firelighting skills with my son or pluck up the courage to ask a question or two. Thanks for your kind words about my blog. Glad you are finding it useful so far. Please feel free to dive into the articles, videos and podcasts. Looking forward to your comments and questions.